Stevenage boss Darren Sarll felt his team paid for being racked by anxiety in the first half against Pompey. The Boro caretaker manager believes his team didn’t get going in the first 45 minutes in Saturday’s 2-0 win for Paul Cook’s side. And that was something they couldn’t afford to do against a side of Pompey’s quality. 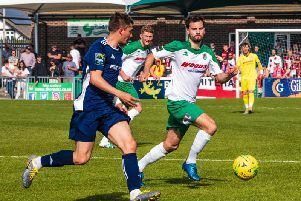 Sarll told the Stevenage Comet: ‘We showed so much fear and anxiety in the first half. ‘We looked like a team that were not quite sure whether they wanted to go that extra bit, whether they really wanted to grab hold of the game take it by the scruff of the neck. ‘Most disappointingly we looked hesitant in that defensive high press that we’ve become so good at and that defensive high press is just attitude. ‘The second half was okay, we were better, we did create chances, we created chances in the first half with a couple of nice balls from Ryan Hedges early on, second half we increased that, but why would you give a team a head start? ‘Why would you turn up at half-time, what’s the point in turning up at half-time you might as well not turn up at all, especially against a good side. ‘When you do concede that first goal it does make it very hard, especially in the way we have played lately, to pick things back up. Despite being unhappy with their performance, Sarll believes Stevenage will look after themselves when it comes to staying up. He said: ‘We have got to be critical of ourselves. ‘We, as a squad, have to accept the responsibility of the performance. We are not going to give anyone else a free ride.